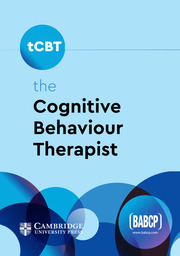 the Cognitive Behaviour Therapist is an interdisciplinary, peer-reviewed, online practitioner journal for CBT therapists, supervisors, and trainers. It features a range of papers, including practice-focused articles detailing clinical interventions, research reports concerning the practice of cognitive behaviour therapy, case reports, audits relevant to practice, and reviews of clinical scales. The journal also publishes papers with an education, training, or supervision focus, as well as literature reviews directly relevant to CBT practitioners. The key requirement for papers is that they contribute to the theory, practice and evolution of CBT. Its electronic format ensures timely publication, facilitating professional debate.